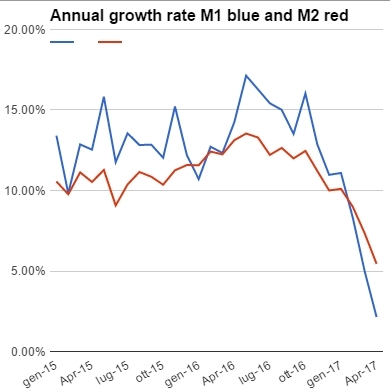 March y/y inflation rate slowed down to 3.14% from 3.34% in March and remained within the he inflation target range of 4% ± 1%. BCDR hikes, slowing loans growth and monetary aggredates should keep this in check. At its monetary policy meeting of March 2017, the Central Bank of the Dominican Republic (BCRD) decided to raise its monetary policy interest rate (MPR) to 5.75% per annum from previous 5.50% effective from April 3, 2017. The short term interest rate corridor will be adjusted proportionally with the short term deposit rate raising from 4% to 4.25% and the repo rate from 7% to 7.25%. 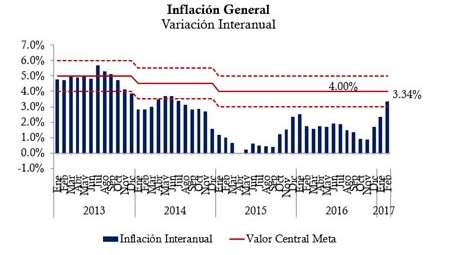 The decision to raise by 0.25% the benchmark rate was adopted after a thorough analysis of the balance of risks around inflation forecasts, as well as the state of the economy as of its main indicators, market expectations and the relevant international environment. In the month of February the y-o-y rate of inflation rose to 3.34%. re-entering the inflation target range of 4% ± 1%. It is the second hike this year and itscontracting effects on the main monetary aggregates are already significant and should start to have a slowing impact on the ecomnimic activity in the second quarter. Annual rate of growth of M1 and M2 are collapsing as seen in the chart below.